Researchers at the University of Bern are providing the most precise calculations so far of the masses of the seven planets around the star TRAPPIST-1. From this, new findings are emerging about their density and composition: All TRAPPIST-1 planets consist primarily of rock and contain up to five percent water. This is a decisive step for determining the habitability of these planets. Of the known exoplanets (planets outside our solar system), TRAPPIST-1e is so far the one that is most similar to the Earth in terms of its size, density, and the amount of radiation that it receives from its star. It is the only one of the seven TRAPPIST-1 planets that is somewhat denser than the Earth, and it is not ruled out that liquid water exists on its surface. At least five of the lighter planets have a covering of volatile substances in the form of atmospheres, oceans or layers of ice. Their water content is up to 5 percent, which is a lot when compared to the Earth, where the seas account for only 0.02% of the planet’s mass. Thanks to the new mass calculations, the densities of the planets can now be estimated more accurately than was previously possible, leading to new findings about their composition. For example, the research team came to the conclusion that the two innermost planets, TRAPPIST-1b and c, presumably have a dense atmosphere, whereas TRAPPIST-1e is probably a rocky planet with a thin atmosphere. TRAPPIST-1d has only around 30% of the Earth’s mass and is thus the lightest of the seven planets. It is presumably surrounded by volatile substances such as water – but it is unknown whether this is in the form of an extended atmosphere, ocean or ice layer. 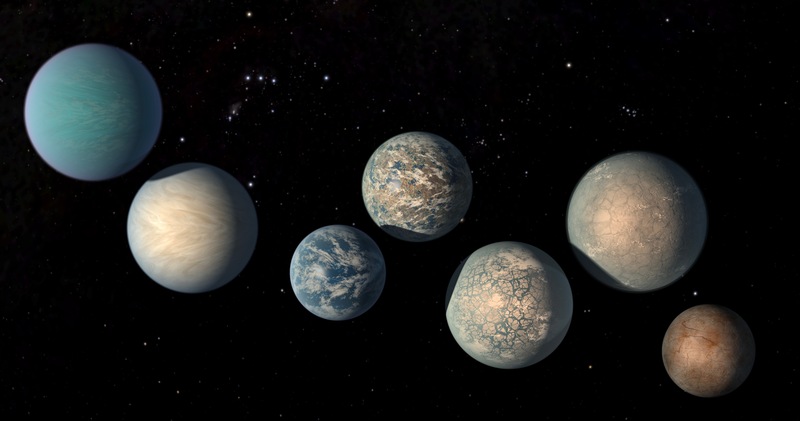 The three outermost planets, on the other hand, TRAPPIST-1f, g and h, are so distant from the sun that their surfaces are probably enveloped in a layer of ice. A study with the Hubble Telescope published at almost the same time, in the journal “Nature Astronomy”, was unable to detect the presence of a hydrogen-rich atmosphere on any of the investigated planets. It is therefore hoped that more precise findings can be obtained about the planetary atmospheres from NASA’s James Webb Space Telescope, which will start operation in 2019. During the next few years, using a telescope called SAINT-EX which is currently being built in Mexico, Demory and his team also want to detect more planetary systems orbiting stars similar to TRAPPIST-1 and to analyse them with their fast computer code. Grimm et al. : “The nature of the TRAPPIST-1 exoplanets”, Astronomy and Astrophysics.